The Samokhodnaya Ustanovka 85 (SU-85) which means self-propelled platform with 85mm gun, in this case the 85mm D-5S anti-tank gun. Where the SU-122 was essentially a mobile assault howitzer, Soviet planners realized that the new German Tiger and Panther tanks could withstand the 76mm main gun of the T-34/76 except at closer ranges and a newer and specialized anti-tank gun was required. The answer came as the D-5T which was a high-velocity 85mm gun that was mounted on the same chassis as the SU-122 becoming the D-5S and providing the Soviet armies with an effective counter the German cats (Tiger and Panther). Production of the SU-85 ended when the T-34/85 entered production armed with the same gun. There have been a variety of SU-85 kits produced over the years but none have approached the level of detail that has just been released by MiniArt. 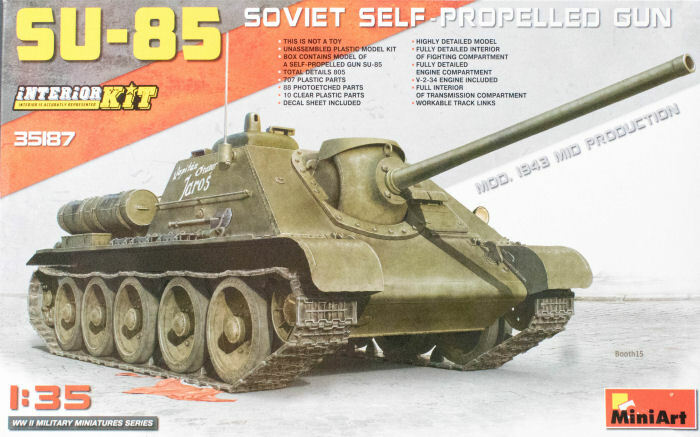 This new 1/35 kit follows several earlier releases including the SU-122 which provide a model that has a full interior - both fighting compartment and engine compartment - which gives the modeler some interesting options. 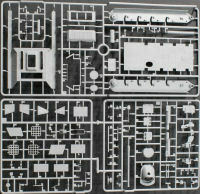 Molded in light gray styrene, this kit is presented on 74 parts trees plus one tree of clear parts (duplicate trees not shown) and one fret of photo-etched parts. According to the manufacturer, there are 707 plastic parts and 88 photo-etched parts in this box. I believe it as there is some serious mass to the box when you pick it up. If this seems a little intimidating to you, not to worry as MiniArt is releasing a version without an interior which will significantly cut down on parts count and complexity. If you want a nice kit of a Soviet Army cat hunter (Tigers and Panthers), this SU-85 is their nicest kit produced to date and they offer another version without the interior for those that prefer a faster and easier build.